In a study recently published by the Journal of Alzheimer’s Disease, it shows that in a clinical trial, Tai Chi was proven that it actually helped seniors to grow their brain size. Improvements also were observed in several neuropsychological measures, which are indicative that the onset of the Alzheimer’s disease may be delayed with Tai Chi practice. 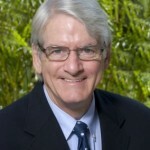 Supported by a grant from the Johnnie B. Byrd, Sr. Alzheimer’s Center & Research Institute, ProfessorJames Mortimer of University of South Florida (USF) and seven other scientists from the USF, Fudan University (Shanghai, China) and University of California-Davis completed this Randomized Controlled Trial (RCT) Changes in Brain Volume and Cognition in a Randomized Trial of Exercise and Social Interaction in a Community-Based Sample of Non-Demented Chinese Elders and reached these exciting conclusions. A representative sample of 120 non-demented, aged 60 – 79, selected from the same district in Shanghai was randomized to four groups (Tai Chi, Walking, Social Interaction and No Intervention) for 40 weeks. 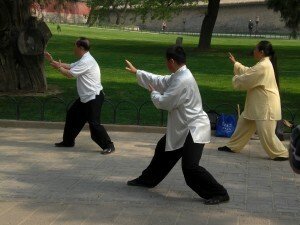 One of the exclusion criteria is that participants could not have prior Tai Chi experience. Two MRIs were obtained for each participant, one before the intervention period, one after. A neuropsychological battery was administered at baseline, 20 weeks and 40 weeks. Each Tai Chi session included 20 min of warm-up exercises (lower back and hamstring stretching, gentle calisthenics, and balance training), 20 min of Tai Chi practice, and 10 min of cool-down exercises. Each Walking session consisted of 10 min of warm-up stretching, 30 min of brisk walking, and 10 min of cool-down exercises. The Social Interaction session included one-hour discussion on topics chosen by the participants. Each group met three times a week. The No Intervention group got phone calls four times during the 40 weeks from a study coordinator. MRI data collected in Shanghai were transmitted to Dr. DeCarli’s laboratory at UC-Davis for analysis. As expected, the No Intervention group’s brain size shrank as an average person in his 60’s or 70’s. The Walking group’s brain shrank as well, except not as severe. The Social Interaction group’s brain size grew, but not as significantly as the Tai Chi group’s growth. The Mattis Dementia Rating Scale is designed to measure and track mental status in adults with cognitive health. 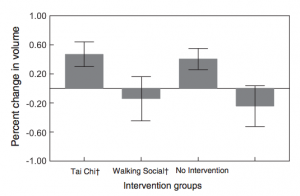 While the No Intervention and the Walking groups had no change in this scale and Social Interaction had some improvement, Tai Chi group enjoyed a significant improvement. The Trail-making tests are neuropsychological tests of visual attention and task switching. It can provide information about the speeds of visual search, scanning and processing, mental flexibility, as well as executive functioning. It is used to detect several cognitive impairments such as Alzheimer’s Disease and Dementia. 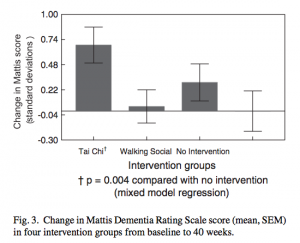 After 40 weeks, the No Intervention group took more time to complete the task, both Social Interaction and Walking had no change in time and Tai Chi group became “sharper” and used less time. The Tai Chi group registered improvements in other evaluations, including the Auditory Verbal Learning Test, the Verbal fluency Test, the Initiation score, Attention score and Memory score. Dr. Mortimer said that Tai Chi, which has been described as a type of moving meditation, requires continuous and sustained attention to maintain posture. The higher level of intellectual involvement in this activity in comparison to walking around a circular course may have been a factor in leading to the disparity of the two groups’ result. This result is consistent with early research conducted by Stanford University, which shows that regular aerobic exercise does not provide the same benefits as Tai Chi to combat memory loss. The Journal of Alzheimer’s Disease is an international multidisciplinary journal to facilitate progress in understanding the etiology, pathogenesis, epidemiology, genetics, behavior, treatment and psychology of Alzheimer’s Disease. It is the authority on the disease and ranked the 24th on the Top 100 medical journal list. Violet Li– an award winning journalist, certified Tai Chi instructor, and certified Heart Zone Trainer, has studied Tai Chi, Qigong, and heart fitness with many grandmasters and experts, and has taught Tai Chi, Qigong, and other fitness programs to various groups. Her passion for Tai Chi, Qigong, and fitness motivates her to write articles on the related events, people, theories, techniques, practices, and health benefits for individuals. NBC of St. Louis featured one of her classes in “100 Year Old Tai Chi Artist”. Ms. Li writes regularly for the St. Louis Tai Chi Examiner and the National Tai Chi Examiner, and has readership from over 18 different countries. Do you have a story or comment to share? Please contact her at violet.li@tadi.com. This entry was posted in The Taiji Examiner and tagged alzheimers, brain, cool down, exercise, stretching, tai chi, trails, university of south florida, warm-up. Bookmark the permalink. I’m interested in these results but the plots are reported incorrectly. I am attempting to contact the original authors to get a cleaner version. If the plots are in error on this site, I suggest corrections are made. It’s great to read something that’s both enjoyable and provides prdgmatisac solutions.